Like most small towns across America, the little villages that make up the South Bay area of Los Angeles each have their own brand of summer festival. Come to think of it, the little hamlets of Manhattan Beach, Hermosa Beach and Redondo Beach don’t just limit their celebrations to the summer. There’s the Old Hometown Fair in October. Then there are the Manhattan Beach Fireworks in December (so clever considering Fourth of July fireworks in this neck of the woods are usually made impossible to watch thanks to the early summer marine layer). Oh, and of course, St Patrick’s Day in Hermosa. We go to it all every year just like we walk the strand every fourth of July and venture onto the cold December sand for the Yuletide 5K. It’s tradition. Navigating the throngs to check out the latest in bedazzled acid washed denim accessories is thirsty work. So, we’ve learned to arm ourselves with a little pink lemonade to keep up our hydration. I don’t know the company but they sell only lemonade and their stands are strategically placed throughout the experience. Four dollars for a coffee doesn’t seem so bad when you willingly shell out six bucks for a lemonade. 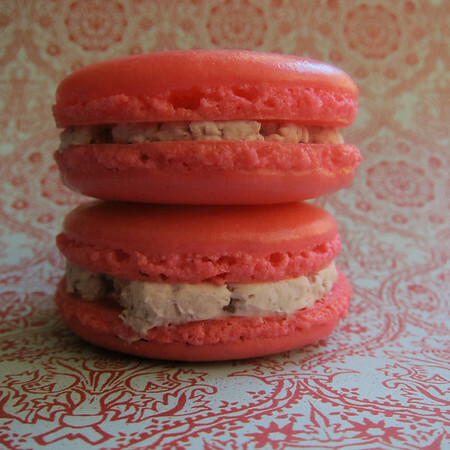 In honor of the capstone of summer parties in the South Bay, this week’s macaron pairs a lemon infused shell with raspberry buttercream. In addition to using dried and ground teas to flavor macarons shells, I’ve also had surprising success with drying and then powdering citrus zest. The lemon comes through nicely without being acidic. In a food processor fitted with a blade, pulse together almond meal, lemon zest and confectioner’s sugar. Give it a few pulses then sift into a medium bowl. Set aside. Using the whisk attachment of a standing mixer or an electric hand-mixer, beat together the plain buttercream and raspberry preserves. If desired, chill for 15 minutes before filling macarons. This sounds like something Pierre Hermé would make 🙂 PS Powdered citrus zest — impressed!